How does a security camera that pans, zooms, and comes with 14 days of cloud storage only cost $38? There are so many home security cameras out there these days and they’re all so similar. How are you supposed to know which one to buy. 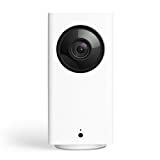 Well if you ask us, the Wyze Cam Pan 1080p Indoor Smart Home Camera is the perfect place to start. It streams crystal clear 1080p full HD video to your phone, and it automatically can record clips anytime there’s any motion and save them to the cloud. In fact, you get an unprecedented 14 days of cloud storage for free! But the kicker is the fact that you can see every inch of a room with one single camera. How? With the Wyze Cam Pan, you can pan and zoom right from the app!